From parking lots to roadways, asphalt serves a critical role in infrastructure. But it must contend with some of Mother Nature’s harshest treatment. 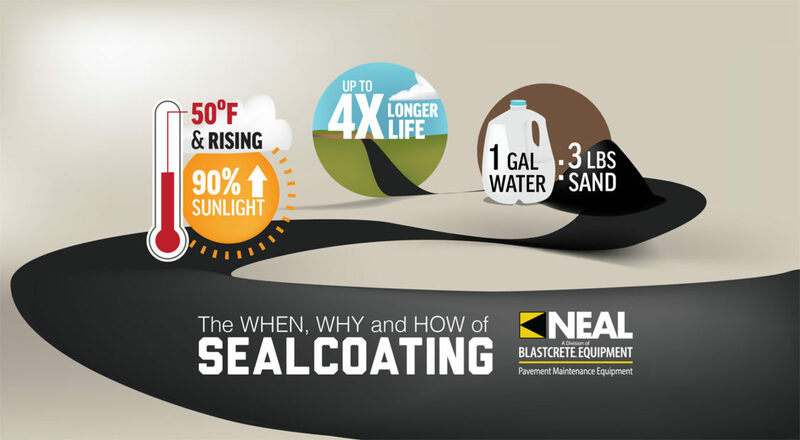 Sealcoating may be asphalt’s best ally for longevity. Here are a few tips on how to do it right. Before any contractor takes on sealcoating, they need to understand why it’s important and how it works to protect asphalt. Water and ultraviolet rays are asphalt’s two worst enemies. They degrade the surface, causing small cracks and voids that make way for water to damage the underlying base materials. If not protected, material failure is imminent and will rear its ugly head, aka potholes. The only way to prolong asphalt life and keep this from happening is with proper and regular sealcoating. Sealcoat material fills the voids in asphalt and creates a protective barrier from water and sunlight. It can even extend asphalt’s life by as much as four times. But, it must be done right and at the right times. Starting with the proper mix is critical to producing quality results. Using “black water,” as we like to call watered-down mix, will never render results that last, and it will quickly give a contractor a bad reputation. Ensure the mix includes as least 3 pounds of sand per gallon of water to provide the right grip needed for safe use by both vehicle and foot traffic. It’s also important to use quality materials and be sure the mix is adequately blended. Always follow the material manufacturer’s mix-to-water ratio recommendation. When it comes to proper conditions in which to apply sealcoat, it’s similar to painting your house. The temperature needs to be at least 50 degrees Fahrenheit and rising, and there should be plenty of bright sunlight. It is not recommended to sealcoat when it’s colder than 50 degrees or during overcast at this temperature. Also, consider how long the area will need to dry and how long the space can be closed to traffic. If your client demands a small window to sealcoat and strip, you’ll need to be sure you’re not applying material on a cool, cloudy day. Heat and sunlight are your best allies to speeding up drying times. A sealcoating baffle attachment, like the AutoTrim on Neal Manufacturing’s DA350 machine, automatically cuts in sealcoat materials on the go, saving contractors time and hassle. Before any drop of sealcoat makes contact with the surface, it’s imperative to prepare the asphalt; that means dry and clean. Clean off stuck mud with a wire bristle brush and use a high-powered blower to remove debris and water. This is where the high-powered blower on our DA350 comes in handy. It’s mounted right on the unit and offers three times the output of walk-behind blowers to clean the area faster and more thoroughly. 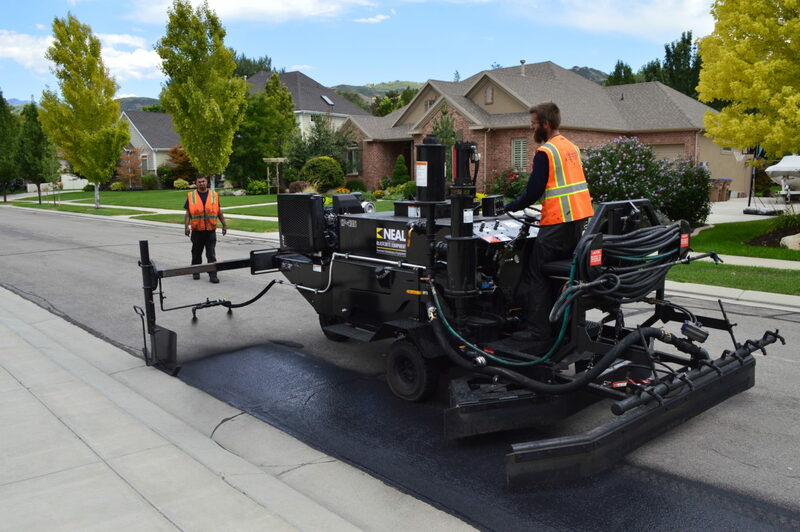 Paired with the AutoTrim that automatically cuts in sealcoat materials on the go, contractors can work as much as seven times faster and with fewer people. While prep work, the mix and knowing the right time to sealcoat is pretty straightforward, knowing how often to sealcoat is a little more fluid. The weather, precipitation, freeze/thaw cycles and traffic can all have an impact and will vary from year to year. Sealcoating typically needs to be done every two to five years, but it’s a good idea to be proactive with clients. If conditions were particularly harsh, check in with clients and go out and inspect the area to see if your services are needed sooner. Have questions about when, why or how to sealcoat? Call 770-830-1282 or email us here.